Double Feature goes camping. The dangers of the great outdoors. Eric talks about filming screen tests for the upcoming movie Director’s Cut. 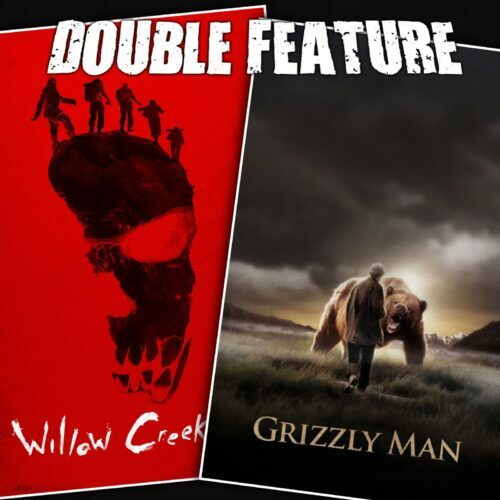 Bobcat Goldthwait’s Willow Creek. Michael wants to talk about bigfoot. The emerging docudrama comeback. Horror based on audio. Why Willow Creek is much more upsetting the second time through. Don’t blame the victim. Grizzly Man as a nature documentary. Bears don’t care about you. Bears will totally eat you. Connecting to a nature enthusiast. Werner Herzog cuts through the magic. This entry was posted in All Podcasts, Year 7 and tagged Bobcat Goldthwait, Werner Herzog. Bookmark the permalink.